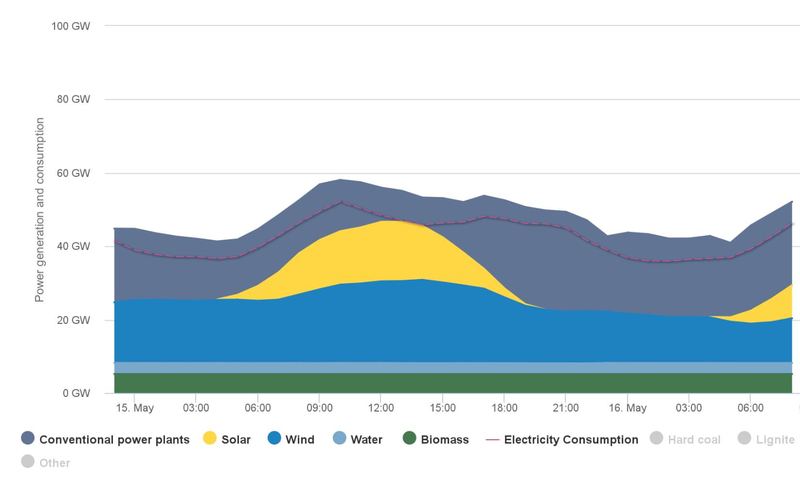 Clean power supplied almost all of Germany’s power demand for the first time on Sunday 15.05.2016, marking a milestone for Chancellor Angela Merkel’s “Energiewende” policy to boost renewables while phasing out nuclear and fossil fuels. Solar and wind power peaked at 2 p.m. local time on Sunday, allowing renewables to supply 45.5 GW as demand was 45.8 GW, according to provisional data by Agora Energiewende, a research institute in Berlin. Power prices turned negative during several 15-minute periods yesterday, dropping as low as minus 50 euros ($57) a MWh, according to data from Epex Spot.